Arctic days on the Planks EP2: About Hamperokken and the Alpha girls. During the weekend we met a young Dutch mountaineer, she was enthusiastic and kind enough to invite us ski with her. 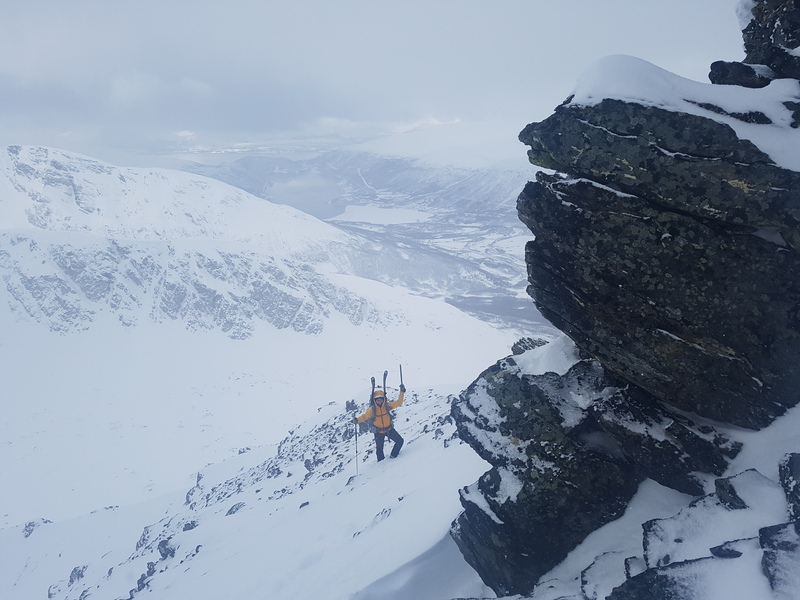 Text message was something like “11.00 a.m. base of Hamperokken, take crampons, two ice axes and a rope.” We checked some topos of Hamperokken and oh god, what a mountain that sweet little Aniek had on the menu for us…. 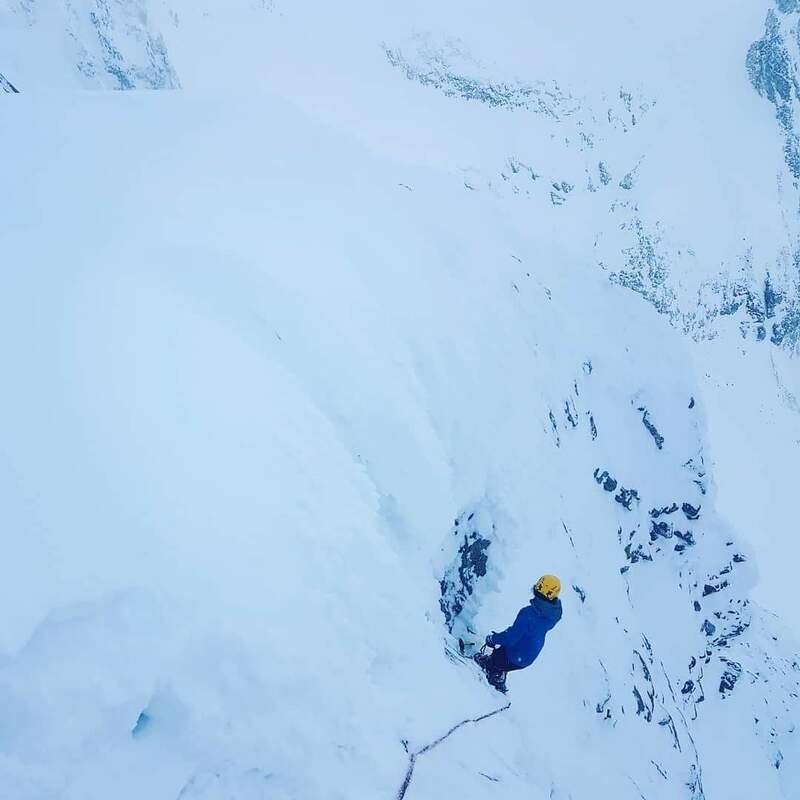 Well, by that time we still didn’t knew that this twenty two year old sender was the second best climber in the netherlands, had participated in an ice climbing world cup, dives every now and then in 7c/A2 routes where she spends several nights in a row, and basically moved to Tromsø for doing as much alpinism as she could. It seemed that Pere and me we would have to man up big times. Artic days on the Planks EP1: about winter in Tromsø and learning to fly. Again the weather turned stormy, those kind of storms that makes you remember that you are pretty much on the middle of the north atlantic ocean quite far up in the arctic circle. 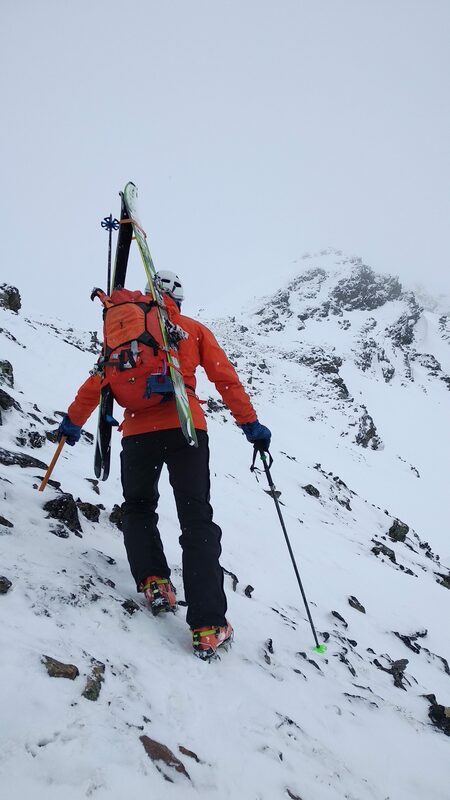 Even though the previous day we felt confident with the snow stability, the avalanche bulletin confirmed us that the weak layer could still be well found in several terrains. Of course we got lost driving the valley in our way to Hamperokken, and as good spaniards we made it around forty minutes late. As they were a bit in a hurry, Aniek texted me that they had already started, we would have just to follow their tracks and catch them up. Pere and I we still were not all the way confident with that super long badass ridge in this stormy day. However the mountain until it’s upper shoulder seemed fun terrain and a great objective for the day anyway. As we were already late, we decided to have a second breakfast before going up. It was quite straight forward terrain to navigate, so we started gaining height quite fast; first through the forest for then getting into this constant long snow slab that reaches the shoulder of the mountain. Once there, it quickly started becoming more steep, icy, and exposed; hence we decided to get the ski crampons on. Once on the real base of the ridge, we decided to bootpack with the crampons on. 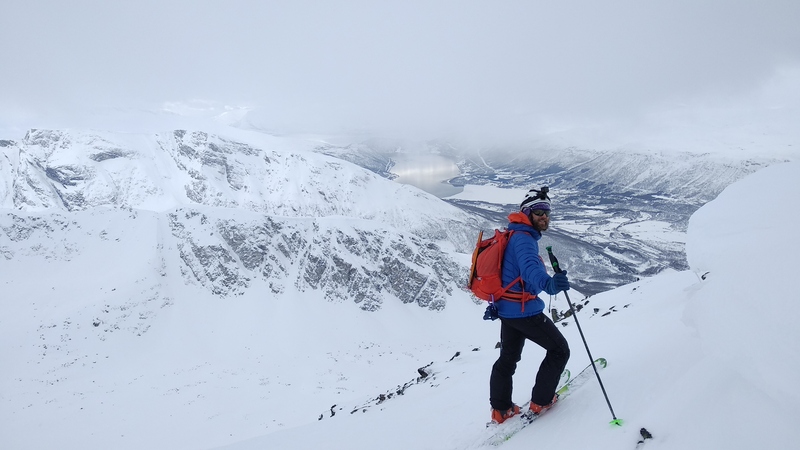 ONTHEBELAY The Tafjord Haute Route: exploration ski where eastern Norway meets the west. The sky was closing down fast. 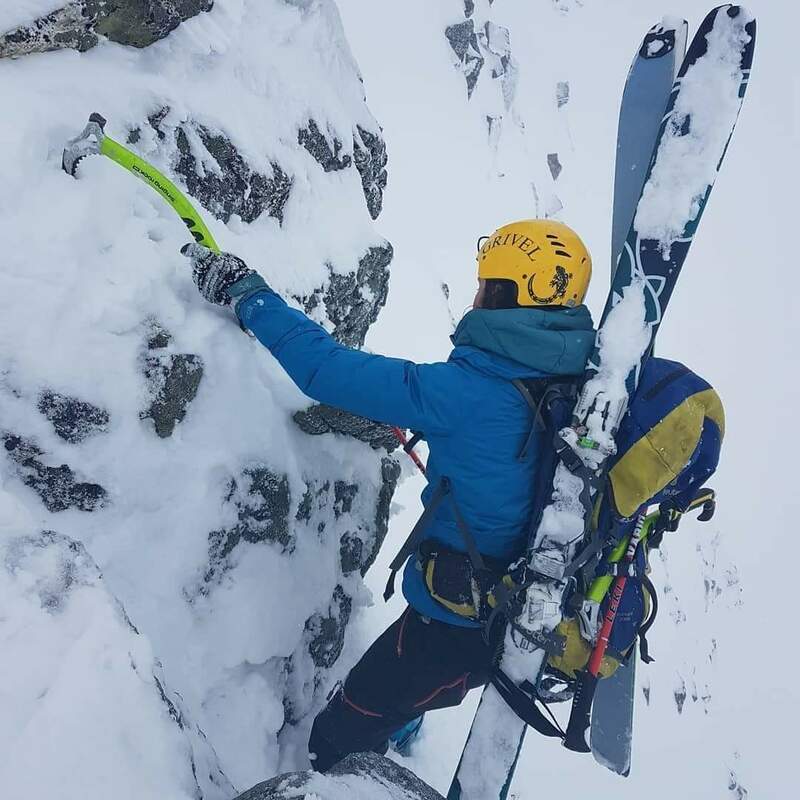 We were unsure if we should continue and get on the upper ridge, but then we got a text from Aniek, informing us that one of them had skied down through a west gully from the shoulder of the mountain, while her and Merrick had continued up. The terrain around the shoulder was really enjoyable ski alpinism terrain. But once we knew there was this escape, we really feel tempted of just ski down one of those gullies instead of perhaps getting into trouble on the ridge. We continued a bit further to explore and help take a decision, but finally we decided to play it safe and ski from there. The first fifty meters were horribly iced, crusted and quite exposed towards a sharp rocky slab. However, we soon started finding that perfect snow for ski alpinism: a cold and fresh layer of powder of around fifteen centimeters over a settled layer. Well, we still were in the middle of a big mountain, big terrain, a little concern with stability and poor visibility. Pere would lead and I would close the group. We decided to break the descend in two pitches and gather in a safe spot. The first part was quite a tense defensive skiing, but the second part was much more enjoyable and felt quite surfy. From there on we soon reached the forest and that was full happy riding. 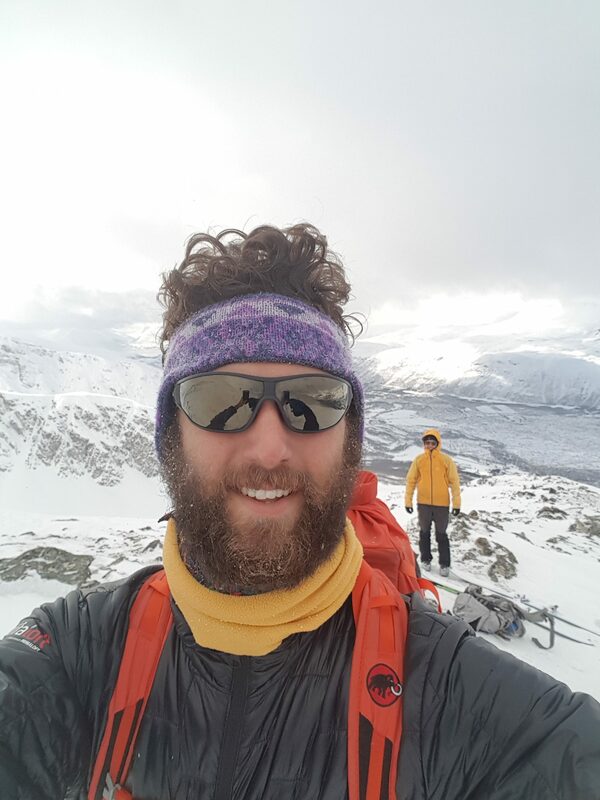 After quite some time I get a text message: “we’re not yet at the summit, performing some snow swimming…haha”. I told them that they had no car left and offered them a ride. We then fixed a meeting time in an hour and a half. ONTHEBELAY Dalbello Lupo AX 125C 2017-2018 Review: First Impressions. When we reached there, the senders were already there, after over eight hours of activity and with a big smile on their faces. We met Merrick, the other alpha girl, a mountain guide from Alaska, now living in Tromsø. In fact her skis for ski alpinism were 122 and with twin tips. from their photos, I think they well deserved the ride…Kickass! Merrick announced us that for the rescue, if we achieved to make it home before her kids were sleeping, she would make dinner for us and let us go to her sauna. Well, it seems that karma is in our side today. After a great evening talking about mountains with some good fish burgers and veggie burgers, an intensive sauna session and even a mini northern light experience, we felt ready for the following day. Ok, today, it was proper hell on earth kind of weather. Merrick and her husband couldn’t join this time, so we left with Aniek towards Kvaløya to see if we could manage a ski tour. Blizzard was strong, and as soon as we crossed the forest and started to get in the high mountain, we decided to play it safe, head home for lunch, and let the big thrills for the climbing gym in the afternoon. We had lunch at Aniek’s. 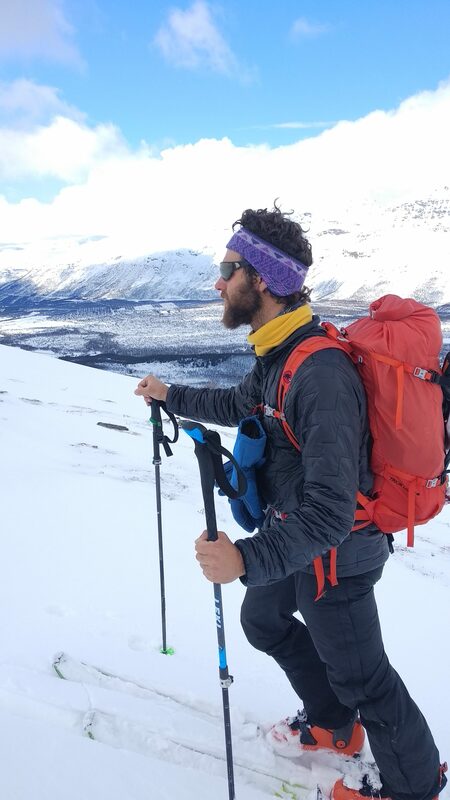 One of her house mates, Johan, joined us, and according to her, he was probably the best aid climber in Northern Norway and someone to get in the mud with in Store Blåmann every now and then. Suddenly we felt quite in the badass club of Tromsø. Fake it till you make it, I guess. ONTHEBELAY Arctic days on the Planks EP4. 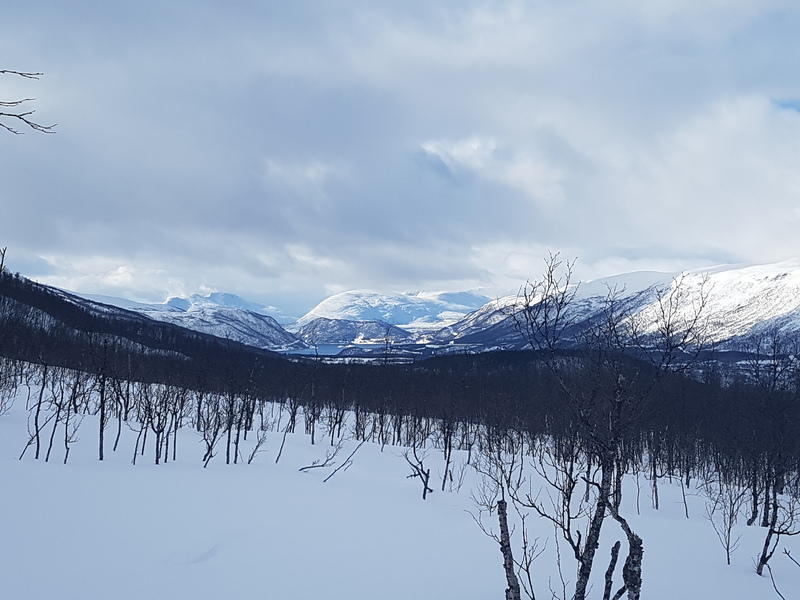 Tamokdalen, Ice climbing, skiing with huskies and discovering Lyngen. Once in the gym, Pere and I achieved to climbed surprisingly well, however the real show was pulled by Aniek. I hadn’t seen yet before someone going so solid onsight on a Norwegian eight route. Actually the whole room got quiet and just stared at her. Fancy. The following day she had to drive back to Lyngen to work, and we had to pick up Pedro at the airport for finally starting our big adventure in Senja, our real objective for the trip. But we will talk about that next week. 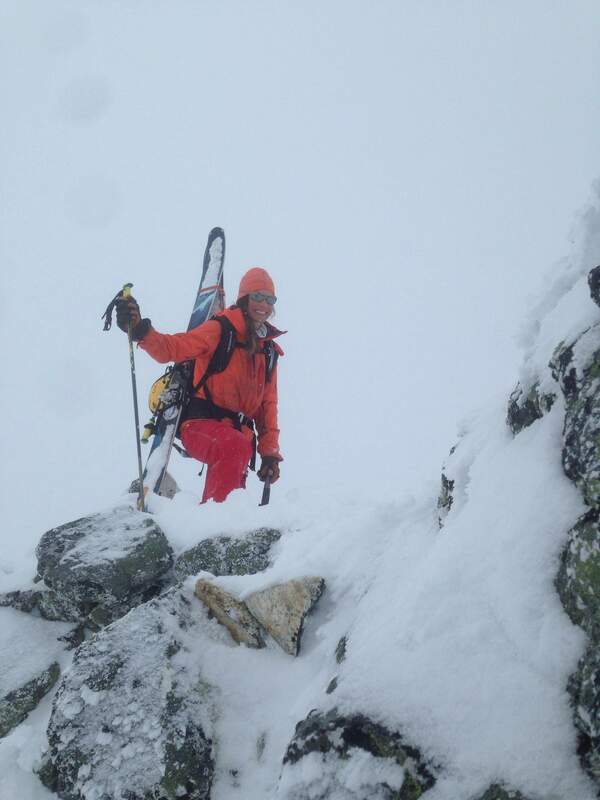 This entry was posted in Adventure Guide, Meet the Locals and tagged MountainSki. Bookmark the permalink. 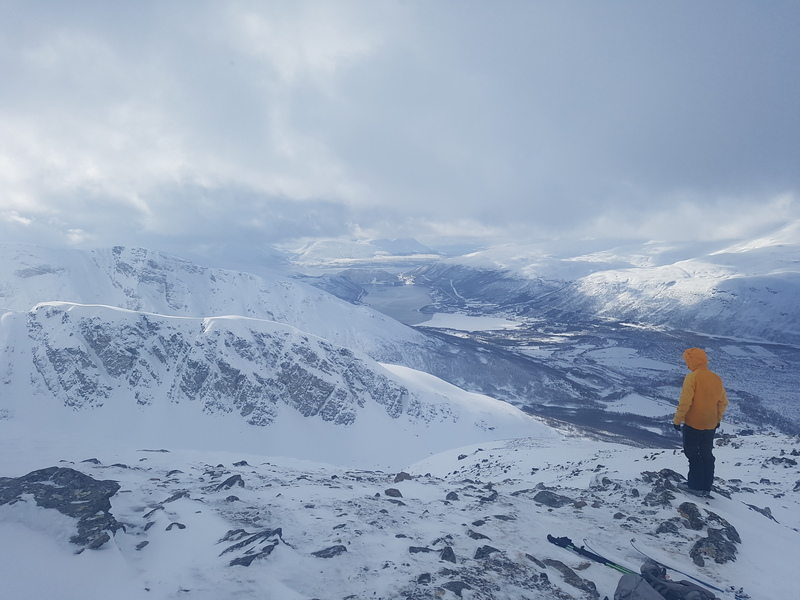 ← Artic days on the Planks EP1: about winter in Tromsø and learning to fly.